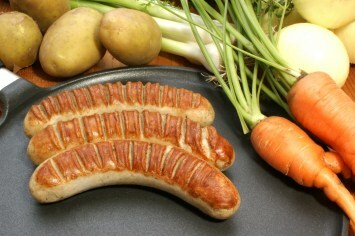 This fantastic bratwurst recipe is one of our easy dinner recipes. I love rustic home style meals during the winter months and this bratwurst recipe is perfect for a cool winter day. It combines tasty sausage with potatoes (a perfect combination), vegetables and “gravy”. The gravy is actually made with a can of soup. How easy is that?! Cook the bratwurst in a frying pan over medium heat. The Polish sausage, if you are using that, is already cooked. Slice the cooked sausage into 1/2" slices. In a large bowl stir together the bratwurst, potatoes, carrots, soup, cheese and the chopped onion. Transfer the mixture to an ungreased 2 quart baking dish or other casserole. If you like, you can add a bit more shredded cheese to the top of the casserole. Bake it, covered, at 350°F for about 45 minutes or until it is well heated throughout. You can add more vegetables to the recipe if you want. Instead of just carrots, use a carrot and peas mix or a mix of frozen vegetables with green beans and corn added. You can also change up the kind of sausage you use. A mild Italian sausage or English sausages would work well in this sausage recipe too. Cook them as you would the bratwurst. Of course we do want to eat healthy most of the time. The low fat soup helps. And do try to get the low sodium soup. Canned soups tend to be quite salty. I think some nice warming comfort food is perfect once in a while and I love this kind of recipe. It’s a lovely sausage casserole with vegetables right in it. Use a low fat sausage, such as a turkey sausage or lower fat pork sausage to really cut the amount of fat in the recipe. I love one pot meals. They are so easy to make and to clean up from. This is a great recipe for using up leftover potatoes. If you don’t have any potatoes leftover, you can cook them quickly and easily in the microwave. Just make sure you leave the skins on, puncture them several times with a knife and cover them lightly with a piece of paper towel. The potatoes don’t have to be fully cooked as they will continue to cook a bit in the oven. Campbell soup recipes are so easy and, like this one, usually really good. If you like Campbell soup recipes, like this delicious bratwurst recipe, have a look at our easy beef stew.